Water is wet, kittens are cute, and I love pom-poms like a fat kid loves cake. The thing about pom-poms is, you don’t even know you love them until you see them together. 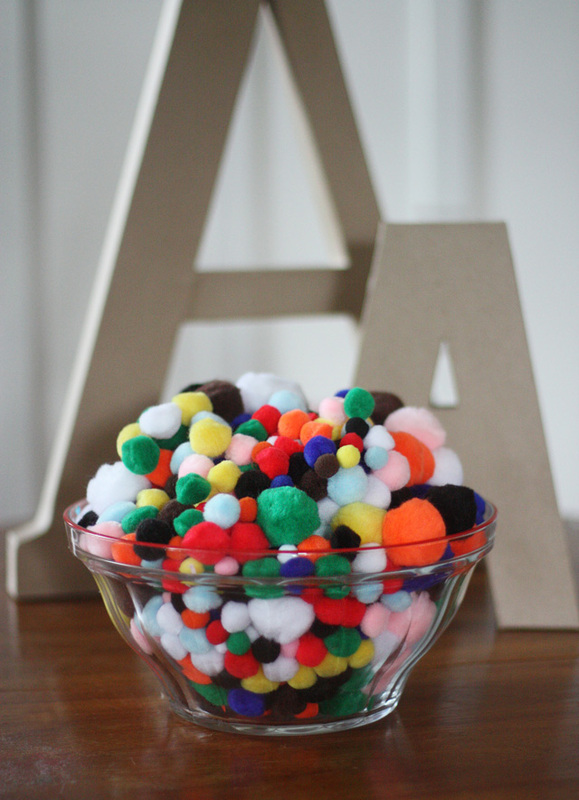 One pom-pom is sorta sad…but ten pom-poms is happy…and a hundred pom-poms is like WHOA. As part of another project, the folks at Darice were kind enough to send me some major, major craft goodies, including these hollow paper mache letters and a muppet’s weight in pom-poms. 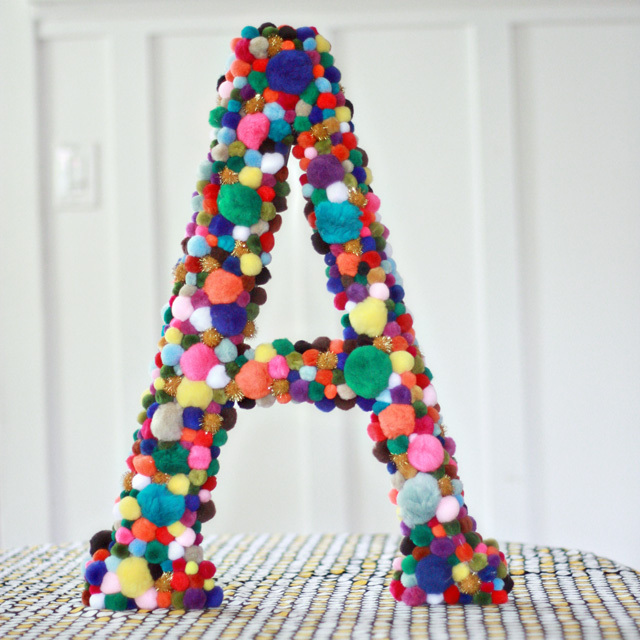 I had seen the paper mache letters floating around craft stores for a while, and I liked them well-enough, but I never bought one as I never knew what to do with one. As soon as I saw the pom-poms, I knew this had to happen. Did you see that? At the top — that’s a coin. That’s right. Not only is it a big furry fabulous thing, it’s a piggy bank! Once again, form follows function. If you make one these and someone asks you why you have a big silly muppet letter on your desk, you can tell them to lay off, because it’s the most practical thing you have going: your very own rainy day fund. Okay, okay, okay, you can skip the piggy bank part and just hang it on the wall. But don’t say I never give you options. 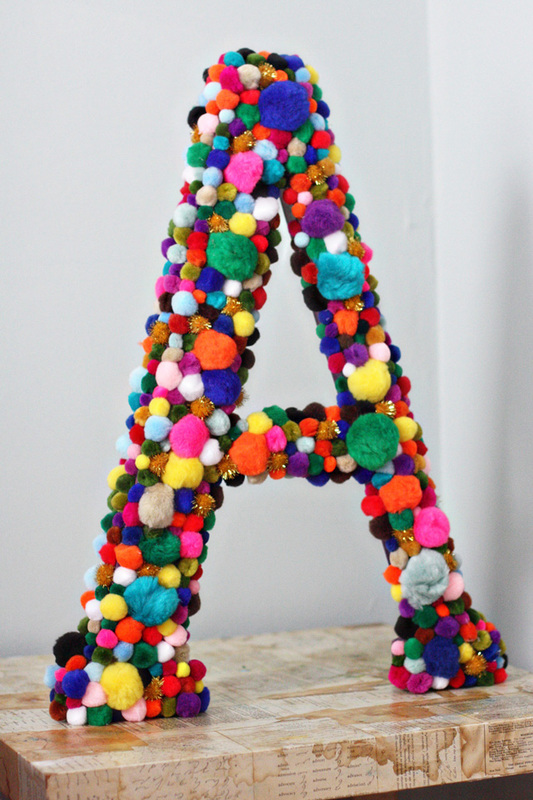 If you want to convert a paper mache letter into a piggy bank (pom-poms or not), all you have to do is insert a slit at the top. Want access to your money later on (without taking to it like pinata)? cut a simple flap on the side and hot a glue a ribbon tab. It’ll stay shut until you yank on it to get your money out. 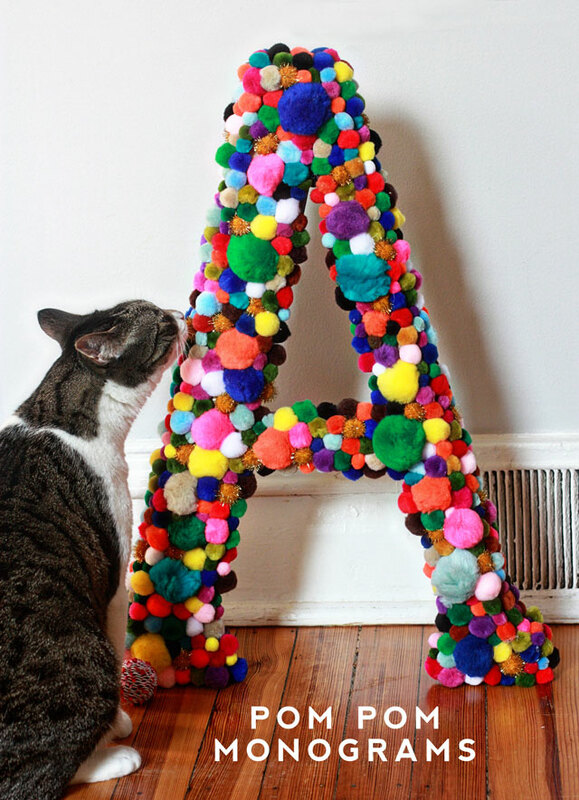 Yentl is wondering why I glued 200 cat toys to a giant letter A. Your response to Yentl is, “So they don’t wind up under the fridge like the last 200 I gave you to play with,” not that I have ANY experience in fishing pompons out from under the fridge. Deb, you know Yentl better than I knew! I’m thinking of gluing some to hair combs…you know, to wear to a crazy party on Sesame street or something? I Love Darice. They make a lot of really nice beads. What else did you get? A grab bag of lots of stuff — washi tape, glue, glitter, etc.. Lots of fun. no.. i just… can’t. traumatized by too many girl scout projects. sorry peaches, i’ll skip to the next awesomesauce thingamabob. but glad you’re out of the closet on the pompom situation. good to know for en you take on the visit all 50 states thingie (ya know, i’ll set some aside for when you crash at my place on your visit to california – oops, sorry! that’s how it plays out in my head, lol). P.S. What’s the deal with the “pompom” vs. “pompon” thing. Is there a difference? Personally, I think “pompon” sounds kinda snooty and British. Maybe that’s just because it makes me think of “poupon” (as in Grey) and “Downton” (as in Abbey). I’d love to know what you think, Auntie! P.P.S. Yes, I realize Grey Poupon is ostensibly French. I’m a Maille dijon girl, myself. 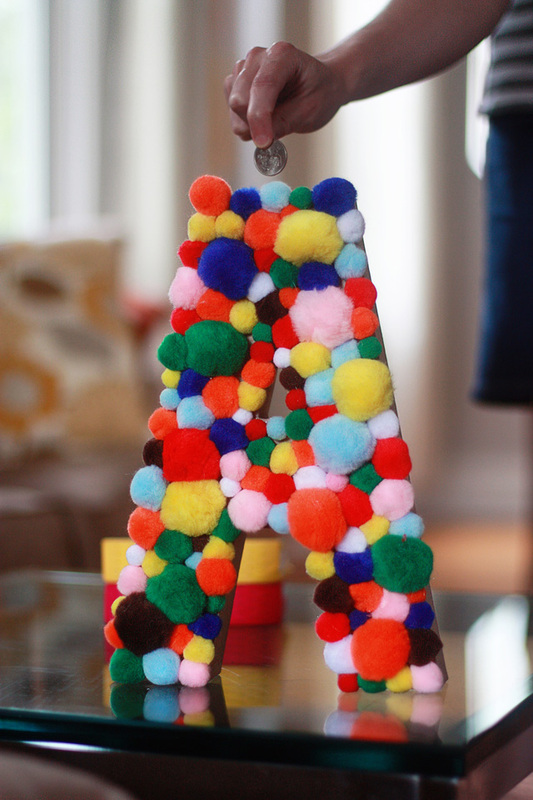 Sorry… for me, pom poms are like the fabric equiv of painted macaroni. Ew. Ew. Ew. I’ll do coffee filter fascinators or arch decorations first. I swear. 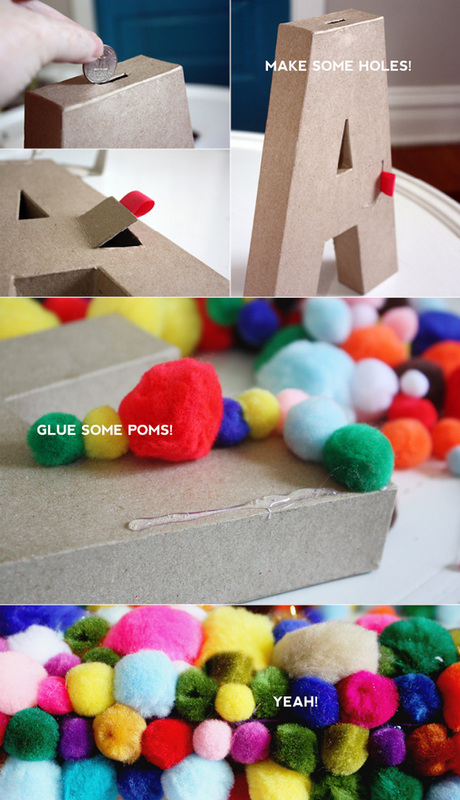 I’d use broken mirror chips before I used pom poms. I wish you would do more projects and crafts like this instead of the other personal stuff. These are the things I like to see. I like making things like this too. Unfortunately, I would have to quit my job in order to have the free time to make things like this to blog about everyday. Fortunately for both of us, there are hundreds of other craft blogs covering this stuff already. I think your site is the perfect mix of crafty and personal. My 2 cents, for what it’s worth (2 cents, I guess). PS: I say keep all the fun for yourself! This is a great idea for a birthday party decoration! You can even fancy it up by only using the metallic pompoms. What a great idea! It doesnt have to be pompoms. I’m thinking Legos or army men for boys, small plushies or bows for girls. Oh how funny! 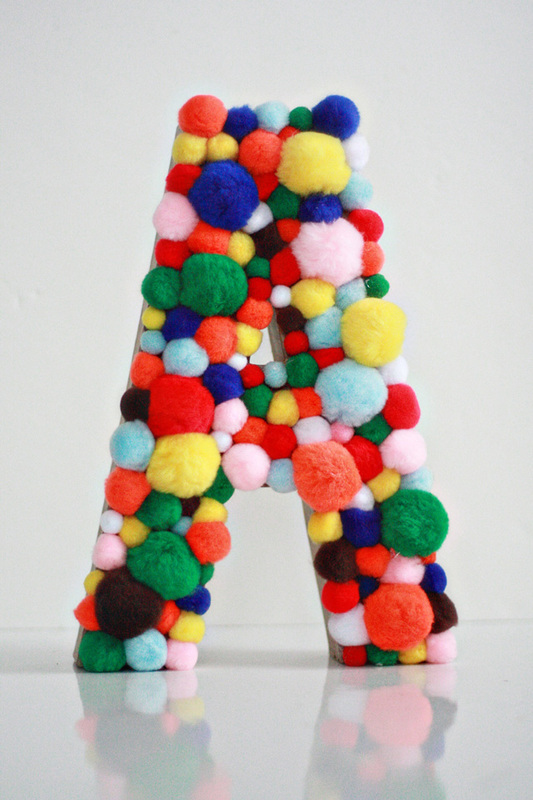 I am working on a pom-pom monogram as well and it is the letter “A”. It was going to be a back to school project only time ran away from me! I love your use of pom colors here. And the dual purpose of a bank? Whoa! What is it about poms and the instant thought of Muppets?